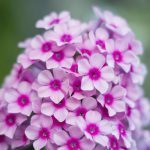 creeping phlox , is mulch bad around it? 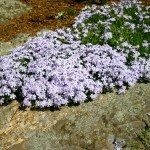 does spreading woody mulch around creeping phlox prevent spreading? Mulch only lightly (1 or 2 inches), keeping the plants damp and especially removing weeds so they don't spread along with the ground cover. Once you've helped the ground cover fill in, you'll have less and less weeding to do (maybe even none at some point) and no more mulch to add.